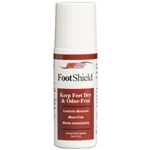 Protect your feet and toes against rubbing that causes blisters, chafing, raw skin, and hot spots. The advanced formula is a dry, invisible, non-greasy barrier. Stay active and pain free. Includes 10 SportShield For Her Towelettes. 2 oz by volume of Stink Free Sports Detergent per Packet. Stink Free Sports Detergent removed all odors and stains in your high performance athletic apparel and gear. BlisterShield creates an almost frictionless surface, reducing heat build-up and blister formation. Additionally, the powder does not absorb moisture, rather repels it, keeping the skin relatively dry; similar to clothing made of "high-tech" synthetic fibers that wick water away from your skin, rather than absorbing moisture like cotton. Also known as Bodyglide liquified powder, this echnically advanced cream transforms into dry, silky smooth shield against irritation. Great for toes and feet. 2.5oz Large sized: This skin protectant creates an invisible barrier on your skin to prevent blisters, chafing or any skin discomfort caused by friction. This Medium sized 1.3oz skin protectant creates an invisible barrier on your skin to prevent blisters, chafing or any skin discomfort caused by friction.